My first "finished" audio construction project was this 25W per channel stereo amplifier. I built it so my daughter could practice her Roland stage piano at bedroom volume levels. It also works nicely as power amp for portable CD/MP3 players, computer multimedia, etc. It was the first time I had the skill, time, patience, and construction help necessary to overcome all the obstacles that stand in the way of making an aesthetically satisfying, good sounding DIY project. 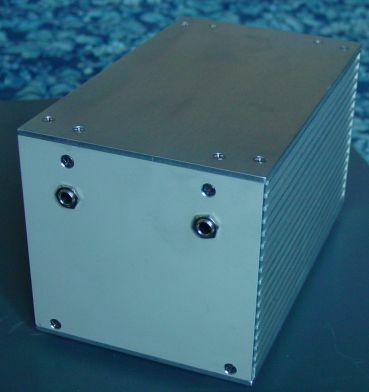 The external dimensions of the enclosure are approximately 235 mm deep x 133 mm wide x 130 mm high. Careful layout and experimentation was required to keep radiated transformer hum out of the audio. The theme for this project was surplus/salvage. Except for the amplifier modules and binding posts, everything else was constructed from surplus or salvaged materials. The left and right sides are constructed from heat sink extrusion. The top, bottom, front, and rear are pieces of 0.125" aluminum EIA rack panel. It's all held together with 6-32 SS flathead screws. My friend Arpad, a fine machinist, did the cutting, drilling, tapping, and countersinking. Total parts and material cost was less than $50 US. 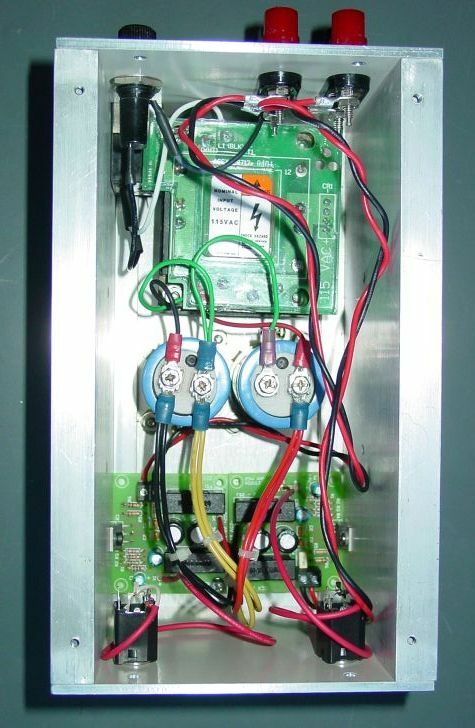 The power transformer is a Signal Transformers 14A-56-36 with a bridge rectifier PCB mounted on top. Salvaged from an industrial flowmeter, the dual secondaries were originally connected in parallel to supply +24 VDC. I removed the PCB, and drilled a couple holes to break the parallel connection traces. Now it supplies the bipolar +/- 24 VDC needed by the amplifier modules. The filter caps are Nichicon 10,000 uF, 50WV from the surplus store. The power supply and output wiring are #18 tinned stranded, salvaged from the wiring harnesses of discarded PC power supplies. 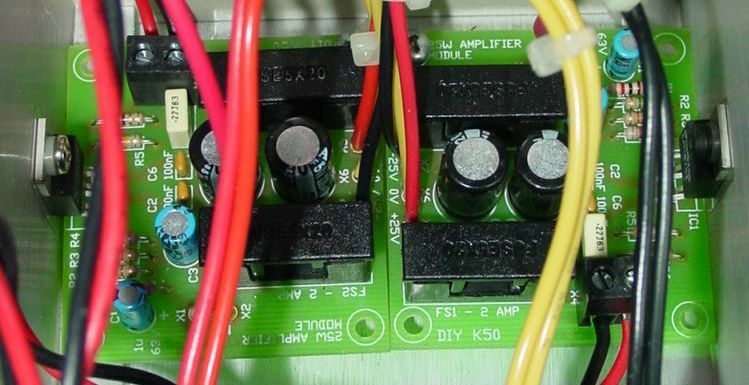 The amplifier modules were assembled from two Kits-R-Us K50 25W amplifier kits, purchased from Quality Kits. The modules are based on the National Semiconductor LM1875 monolithic amplifier chip. The PCB and components supplied with the kit closely follow the example circuit appearing in NatSemi's data sheet. The LM1875's are the two TO-220 devices attached to the heat sinks at left and right. They are isolated from the case by a mica insulator and nylon screw inserts. Without an adequate heat sink, their idle dissipation of ~5W will cause thermal shutdown in seconds. I got the enclosure design and component layout correct on the second attempt. The amplifier modules must be well-separated from the mains transformer to avoid picking up its radiated hum. The distance required depends on the orientation of the windings with respect to the PCB's as well. 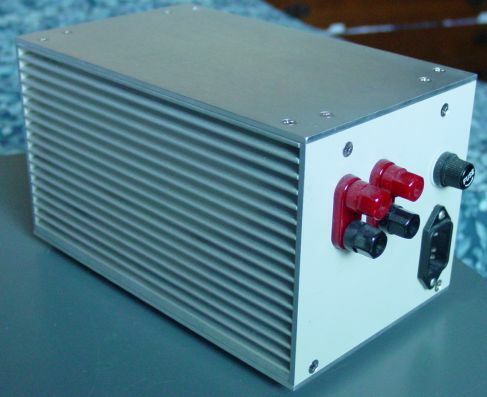 The first version was arranged like a miniature Crown DC-300: a centrally located power transformer, flanked on each side by a power amp/heat sink module. With less than 50 mm separation between the transformer and amp module, both channels hummed disappointingly loud and clear. With the current transformer/PCB orientation and 75 mm separation, there is no audible hum. The input jacks are also located on the front panel to keep them away from the AC. The large heat sink area is sufficient that thermal shutdown is unlikely with 8 ohm loads. Audio performance is quite good relative to the $10 US cost of each amplifier module kit. I find it slightly forward in the midrange. The world of hi-fi has developed a cult of minimalism around certain monolithic amp chips like the LM1875, LM3875, and their brethren. These chips allow a complete amp to be built with 9 or fewer components per channel. Cultists believe audio nirvana can be achieved by using exactly the right construction layout and materials, resistors, and capacitors to augment the inherent quality of the circuit design and uniformity of chip fabrication. You can get a handle on cult activities by googling for "gainclone". I certainly agree that these amp chips are inherently good (absolutely incredible for $2 a chip), and careful tuning of the external components can make a good thing better. The PCB for these K50 modules is high quality, but the caps and resistors are nothing special. For my next chip-amp project, I may stuff K50 PCB's with better/different parts, or do my own PCB from a gainclone cult design. The 56VA rating of this transformer is fine for one channel, marginal for two channels, and way under-spec by cult standards. It's also designed for 115/230 VAC mains voltage, so a 120 VAC+ line voltage puts the output at the filter caps about +/- 27 VDC, which is uncomfortably close to the +/- 30VDC maximum for the LM1875. I've stress tested it to thermal shutdown with 4 ohm speakers - the power rating is reduced, and the power supply voltage should be also. If I ever start playing it loud all the time, I'll add a few diodes in series on each power supply rail to drop the voltage a bit. The LM1875 and similar do not make good headphone amps - they are not stable at unity or low gain, and output way too much voltage and current for dynamic headphones. With speakers, the line output on my computer's soundcard (a Turtle Beach Tropez+) has too much drive for the 24 dB voltage gain of the amp - I haveto keep the computer volume way down to stay in the room with it. The gain is just right for use with the line outs on the Roland RD-600 piano. I can add a volume pot/attenuator to the front of the amp if needed. Since I built this amp, I've picked up a few surplus toroidal power transformers that should be perfect for the next chip amp project. The radiated hum situation is supposed to be much better with toroids.